Making a genuine SitCom is a very tough task. Kundan Shah successfully achieved a milestone with several movies and his expertise is quite evident in Hindi TV Serial Yeh Jo Hai Zindagi as well. As you all know, Rakesh Bedi plays Raja in the TV Serial. This is one episode which is more focused on him. Otherwise, his role have comparatively minor footage. He however doesn’t let go the opportunity he got, and acts pretty well. Hope and Depression both are infectious. When you are happy and in good mood, you will cheer up everyone around you. On the contrary when we are in bad mood, it is quite evident on our face and even in behaviour. And the same happens with Raja too. He is passing through tough times. He is trying to get a job so he can earn some money and earn self esteem. He however was unable to get any proper job till date. He consider it as his misfortune and ultimately started considering him a worthless guy. By seeing him getting into depression his sister (and female protagonist) Renu asked Ranjit (her husband, male protagonist, Raja’s brother-in-law) to find a way to cheer Raja up. Renu and Raja then decided to take help of their good friend Kiritbhai who is a Gujarati businessman. Kiritbhai understood that Raja started developing inferiority complex and on the way to become a problem child! He willingly decided to help him. Kiritbhai appoints Raja as a salesman in his departmental store. So he can meet with new people, have changed environment and most importantly got a way to earn money and use his skills for the same. The things however went wrong for Kiritbhai and his store. Raja started working with a negative attitude and he even started telling the customers that the things available in the departmental store at very high price, are actually available on footpath for a very cheap rate!!! It obviously made Kiritbhai loosing his regular and valuable customers! What will happen now? Will Raja be able to find a reason to live a cheerful life? Will he become a good salesman or will Kiritbhai kick him off from his store? The answer lies in the rest of the episode. Of course the episode belongs to Rakesh Bedi, but Shafi Inamdar is equally competent. His comic timing is superb. Swaroop Sampat is a good actress. Sometimes however you feel that she need to work a little on her pronunciations. She is fine otherwise. She look a perfect middle class housewife. And she is a working woman who handles home and office both pretty well. Satish Shah got a chance to play various characters in this TV serial and in this episode he plays Kiritbhai. He is believable. The master stroke of this episode (actually entire TV Serial) is the tuning of the actors with each other. When we talk about any media, be it a play, a TV Serial or a movie, the repo between the actors play a vital role. In terms of entertainment industry, it is often called as – chemistry – between the characters. In addition to being seasoned actors Satish, Late Shafi, Swaroop and Rakesh all share a genuine bond of friendship and it is visible on screen. The comic timing of an actor can go to vein if not responded properly by his/her counterpart. It is handled pretty nicely here. 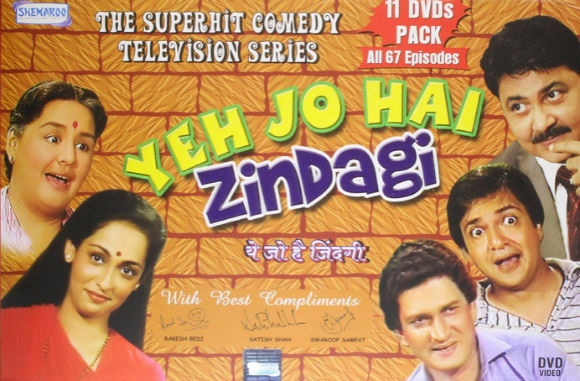 Like Sarabhai v/s Sarabhai, this episode of Yeh Jo Hai Zindagi also gives you genuine joy. Sharad Joshi’s writing is fantastic. The stuff is written in quite natural manner. It is executed by Kundan Shah brilliantly. This TV serial is evident that if you have good resources (read writer, actors, director and most importantly content), you can create a high quality SitCom in very low budget. There is no need to implant double meaning dialogs, vulgar gestures, skin show or any other cheap elements to make it effective. The DVD quality is good, however the original stuff is filmed with technological limitations, compared to the HD content we are used to watch these days, you can find it little dull (in terms of print). The audio is good. The sets are realistic and wardrobe is authentic. No character in this serial wears make-up and jewellery when they are doing their routine work or sleeping (like some of the modern day melodrama, which makes them more un-realistic). Do you like this article? Did you watch this TV Serial? Are you planning to re-view it soon? Do share your emotions via comments below. And if you like this review article do not forget to share it with your friends over various social networks via Twitter, Facebook, Google Plus and others. And yes, you may like to subscribe to our RSS feeds and follow us on various Social networks to get latest updates for the site to land right in your mail box.